In September of 1943, at the tender age of 18, my dad was drafted. At that point, my Grandmother, Dossie, started a ‘Scrap Book‘. She wrote about what was happening and gathered telegrams, letters, newspaper clippings—all sorts of information. Dossie was not exactly ‘organized’. She was a dynamic, wonderful whirlwind of a woman, who had a quirky nature. Often the description on the back of a family photo read something like “all of us“—which was true, but not necessarily helpful. Even the book’s history is intriguing. Apparently the book and all the accompanying bits of paper, photos, and such were in a cardboard box. Early in my parents marriage, my mother started to throw out the box. To ‘make up’ for this egregious error, she took the whole mess to be ‘laminated’. That’s good news and bad news. The laminator paid little attention to chronology and backs of pages. I’ve tried several times to ‘fix’ it, and it’s determined to stay a bit chaotic… but then it is about the most chaotic thing to ever happen to my dad and his family. 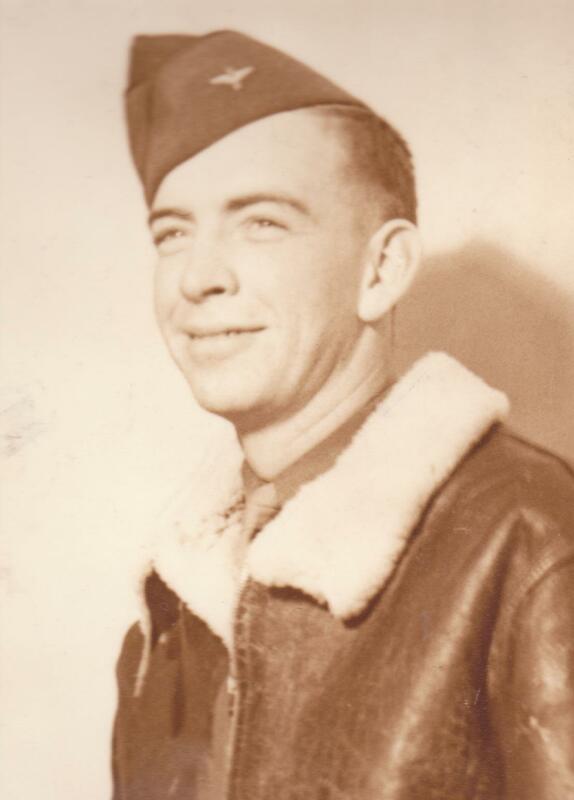 He ended up in the Army Air Corps, serving as a tail gunner on a B17. On December 7, 1944 his plane was shot down after a bombing run over Germany. Parachuting out, he was eventually turned over by Hitler Youth who found him hiding in an elderly woman’s basement. He ended up in the Stalag Luft 1 POW camp in Northern Germany. The camp was liberated on May 1, 1945. My dad weighed 110 lbs. I’m just giving you the basics. There are many stories to tell about his time in the war, and also about how it was for my family back home. What I really wanted to write about today is this fascinating tidbit I recently found in the book. And guess what? It’s about money! On May 20, 1945 my dad wrote a letter home. It was his first letter since being liberated, and most of it was a recap starting with his being shot down. I think the reason for the rehash is that this was the first letter that he was able to write that was only censored by Americans, and not his captors. At the end of the letter he wrote: “Deposit $100.00 in the Wyoming Loan and Trust for I lost a bet and wrote a check on that bank. All My Love, AC ‘Slug’ Stone” My first response to this was to laugh out loud! It’s so my dad. Here he is, a young man of 20, who has only been ‘free’ nine days, and he wants to make sure he honors a debt! Amazing, and yet perfect. So back in those days you could literally write a check on a cocktail napkin. Who knows, the one he wrote may have been on one! He wanted to make sure that his check didn’t bounce. It’s impressive. And here’s the check. It was actually cashed at the bank on July 12, 1945 so it took some time. It’s a counter check. Just a blank typed form with the information hand written in. This is not the original check, it’s the bank making up a check for their records. The signatures are also not original. There is also an intriguing piece in the way he made the request. It was a simple request, with little explanation. Which tells me (of course I kinda know this about my dad) that him making a bet was not a remarkable thing. Yet this was a large bet. $100 in 1945 was a major chunk of change. I did a bit of exploring and discovered that it would be about a $1,395 bet today. Yipes! So here’s this 20-year-old kid, who has just been freed from a terrifying experience. I’m sure there were times he thought he’d never make it out of the camp. With all that, top of his list is honoring his bet? I can’t think of a clearer representation of what I mean when I say that Money is Reflective. How is your money reflective? Give me a call at 503-258-1630 or leave a comment. This entry was posted in Money is Reflective, responsibility and tagged B17, Stalag Luft 1, WWII on November 28, 2018 by Shell Tain.